Attended a PebblePad workshop in Preston today at which a demo of PebblePad 3 was given. Didn’t get the opportunity to play with it directly 😦 but some demo accounts may be available shortly so will keep my eyes open. Interface looks light and airy with more opportunities to use it a more like your desktop. Multiple asset types can be opened which is good. Text formatting within asset fields is also great, which will make blogs and webfolios better in appearance. There is a social element that draws in from popular Social Networking apps, Facebook, Twitter and Blogger, as well as posts out. Institution tab acts like a portal with one stop login to other systems, pulling information in and linking out to more details, all admin customisable. The main difference is being able to completely customise the standard wizards and forms with your own designs. At the moment you can create new forms but not replace the standard set. The other useful feature is being able to replicate assets across multiple PebblePad accounts. The workshop also went over some of the features in 2.5 and I now understand the potential of forms and gateways much better. One of the issues we have had with PebblePad and the disengaged students is being able to assess what they are having an issue with. If we had used the Gateway instead of a Blog we could have tracked student progress much better. The other thing I realised was how you can create a work booklet for students to complete as they progress through their studies. Again shared and published via a gateway, becomes an effective means of keep track of students you don’t meet face-to-face. Some good lessons learned today, Ill be definitely working on the booklet idea. Possibly as a means of implementing focus questions around the GROW model of coaching, for staff and students. We had a very interesting discussion with Sheila MacNeil, Wilbert Kraan and Sarah Knight recently. Though it was intended to be an update on the technology used to support PC3 the topics were quite wide ranging. 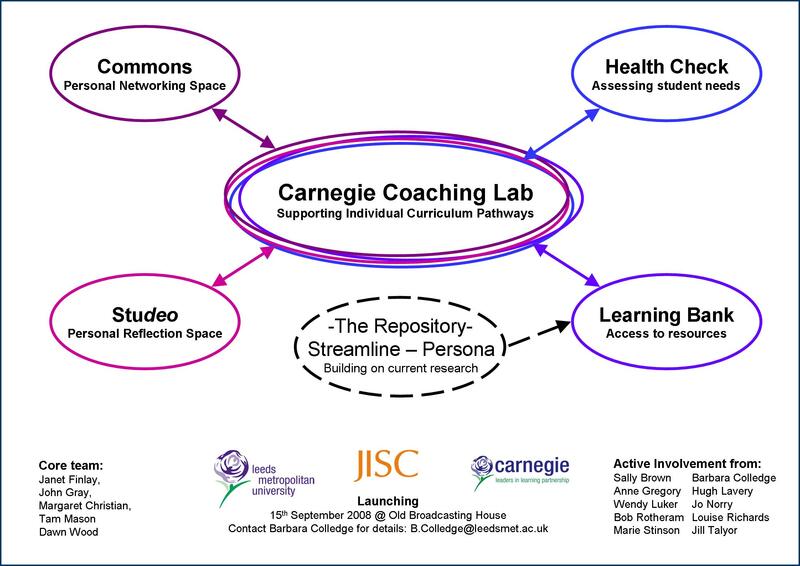 From our initial focus on PebblePad, Elluminate and a small range of tools to support the creation of learning objects we eventually reached issues relating to XCRI, the TENCO project and the JISC competencies in design studio work. We are also planning on offering students access to the Ning however this is on the back burner for the present – possible in danger of overwhelming the students with technology..
For PC3 the choice of PebblePad reflects the need for a tool to support reflection, a place to store objects with a variety of data formats, the need for profiles to enable competency mapping, facilities for peer support and a mechanism to help us introduce evaluation activities. It is also a recognition that Leeds Met has an e-portfolio steering group that is currently in the process of identifying an appropriate tool for use across the university. As far as possible PC3 would like to take advantage of any chosen tool – several members of PC3 are on the steering group and are well placed to ensure the needs of the project form part of the criteria for evaluating potenial e-portfolios. The first cohort of students to enrol on the PLC (Personalised Learning through Coaching) module will begin their studies very shortly and we are making use of the University web conferencing tool Elluminate to support some distance coaching with them. We have had some experience of using this tool and are aware that there are a number of things that could go wrong here however we feel that we will be able to cope with any teething issues. On a related note the need to create learning objects to support the PLC module has meant that several members of staff have made use of tools such as CourseLab and GloMaker. Our experience so far has been mixed with CourseLAb failing to generate SCORM packages that will run under X-Stream the Leeds Met VLE and GloMaker being somewhat limited in what it will allow the creator to do. We are currently in the process of creating independent learning objects using HTML templates such that the results can be imported into X-Stream and also added to our institutional repository. These outputs will also support the OER project UniCycle also running at Leeds Met. Sheila was very helpful here bringing to our attention the availability of a knowledge integration tool for content transcoding, the Open University Atelier-D project and also the 10competence project. We were also directed to th work under way at MMU on competency mapping. Overall this was a highly successful conference so thanks to everyone that took part. I attended an interesting demo on training videos today that has lost of potential for creating interactive learning objects. The system presents a video scenario which can have questions or choices embedded within it. These can then be answered/chosen by using a personal response system. At the moment this is designed to work with systems other than the one that we are currently using but the creators are looking to extend the range, so there is hope. Regardless of this most of us at the demo were considering the application of standalone embedded videos within the VLE. Negating the need for a personal response system. From the perspective of PC3 I can see this being a useful tool for gathering together a group of resources into a single learning object. Where we have several models of different views of a particular concept we can let the student explore the ones they are interested in then return to where the choice originated. Another use, demonstrated at the demo, would be to create coaching objects that show how, for example, client questioning can take the client in different directions. This might be a complex one to set up, but having just gone through coaching training, I learnt much from watching others coach and seeing how the techniques used directed the conversation. I have gained a trial version J which I will explore over the next month and see what we can do with it. Just combining it with the simple animation process we used at the LO workshop could produce some very effect learning material. I was trying to work out how to use the metadata to form links to course specifications. The problem with a pathway like this is the metadata could be infinite and unknown. If you design for a fixed step pathway you will have those that don’t fit and infinite steps requires complexity that is probably an new application in itself. As usual it takes a conversation with some one else to solve the problem. Was talking metadata and repositories with Nick this afternoon, and the thought stuck me. The important thing is not the pathway, the order in what some one takes the modules is not really relevant. What is relevant is the link between the competencies they want to improve the course/module they take to achieve this. A simple (parsimonious) solution is to just map competency gaps to course/modules taken. This would mean a known and minimal set of metadata. Pairs are such an obvious computer science solution; don’t know why I didn’t think of it before. @MrNick thanks! This would, I suspect, is probably more in tune with how most individuals would search for such information, one step, competency, at a time. For those who want to generate a complex series, the search engine, using specific fields should be plenty. Still need to think more on this and it may not fit with the vision the rest of the team wish to offer students. I spent a pleasant morning talking code with Mike and Nick who are working on the repository and various methods for enabling access from other applications. They (and the X-Stream team 🙂 recently enable tutors to access the repositories Learning Objects (LOs) via a power link in X-Stream. Basically this means when creating a course the tutor can select the power-link, search the repository and embed one or more of the returned LOs as part of their modules content. Now all we need to do is fill the repository with LOs, not an easy job. During our discussions I asked them if it was possible to create a link that the students can use to search for content and research. This would be useful for the PC3 project for several reasons. Since we are considering using X-Stream as our main port of call students will need to be able to search both LOs and research papers for their own learning, as well as search course specifications and learning paths to help them decided on their own learning path. Nick said he would look into it but it wasn’t a perspective they had been considering. The alternative will be either a link to the intraLibrary login, with students using it directly, or a link to an external search facility, like the one the repository team have already developed for research papers. The Studeo, personal learning space, was originally perceived as some type of ePortfolio, hence the conferences. At Wolverhampton we were first introduced to the possibility of using a blog, such as WordPress, to support this personal reflective space. There are several issues with this such as external or internal hosting, making it public or private, and limitations on space if video blogging is used frequently. Campus Pack Fusion sort of answered some of these problems. 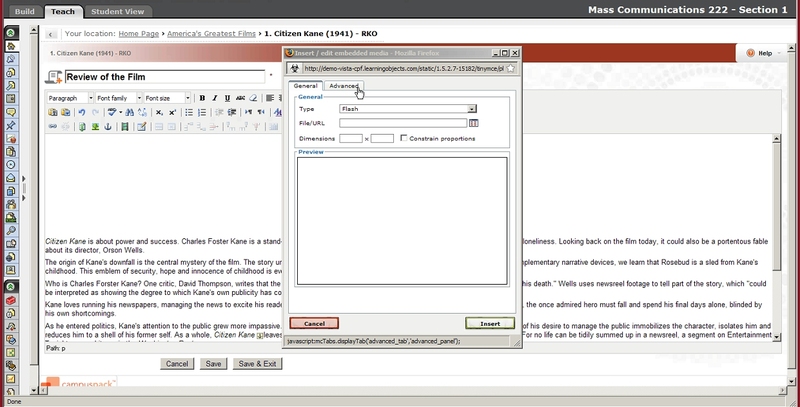 The pack contains both a blog and a private journal module that can be embedded in X-Stream or hosted separately. Each post or reflection created by a learner should be able to be linked as evidence to a set of competencies (either directly or via a referencing system). The learner should be using one application for reflection, and be able to choose who they wish to share each post with. Rather than having a public and a private blog. At the assessment or any other critical stage learners should be able to select a collection of suitable reflections and present them however they choose. Coaching Lab resources – Face-2-face, telephone, email & Elluminate for communications. Attended a webinare today showing the various elements of Campus Pack Fusion (CPF). This suite of tools plugs into the X-Stream virtual learning environment (VLE) that is used at Leeds Met. It can also run independently as individual learning spaces. It uses the same build, tutor and student views provided by the VLE, and the various tools are selected from a drop down list. Each can then be configured regarding who has access, description, purpose etc. 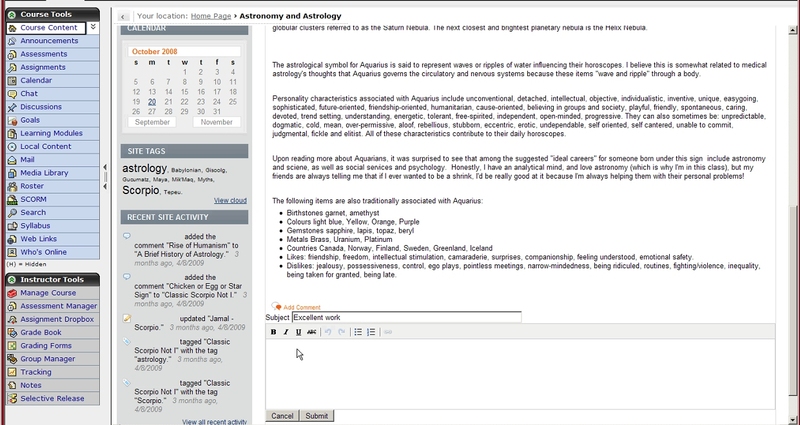 the tool set includes a blog, wiki, podcast feed and private journal (only student owner and selected tutors can view). We are looking into this package as a solution to an ePortfolio. At the moment the blog and wiki tools are the same as you would find on the web. The company are in the process of developing some templates to represent portfolio but no details were given on how this will look. The two main issues that I have with this package, as compared to dedicated ePortfolio, is that view and edit permissions are set by the tutor (with X-Stream version only) and they apply to all content not specific posts (both in X-Stream and external). 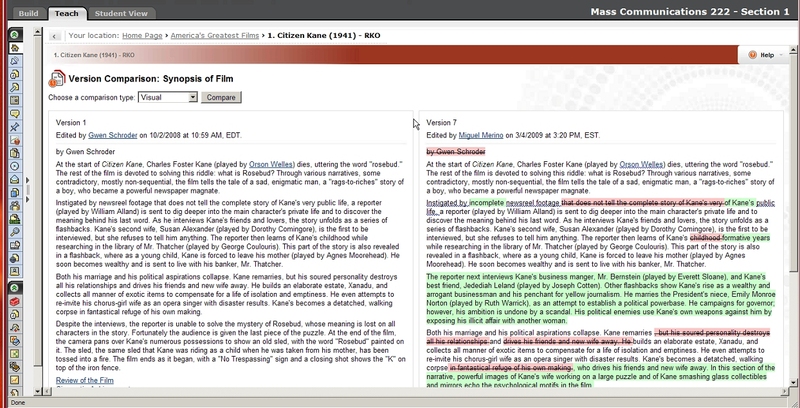 A work around would be to use the external learning space for all reflections and then cut and paste selected content into an assessed blog or wiki with in X-Stream. That way a student can choose what they want to share and still be able to reflect intuitively for themselves. I did have one idea while attending this, which was really well done by the way. That was to use a wiki as a competency resource collection. We could set up a page for each competency that students need to cover. Everyone, students to tutors, can add and comment on any content, modules, courses and other resources they have come across, or simple as a way of sharing experiences and providing support. This would have to be external to X-Stream as it would be a useful resource to pass form cohort to cohort. This is somewhat similar (or may be exactly like) to the competency wiki put forward by Serge Ravet at ePort2009 workshop. This suit could do the job we are looking for with some work-a-rounds. There’s no clear way at the moment for individual students to link evidence to competencies, an element we are keen to provide. We would also have to use a simple spreadsheet for competency evaluation, something we have already considered as a first step. 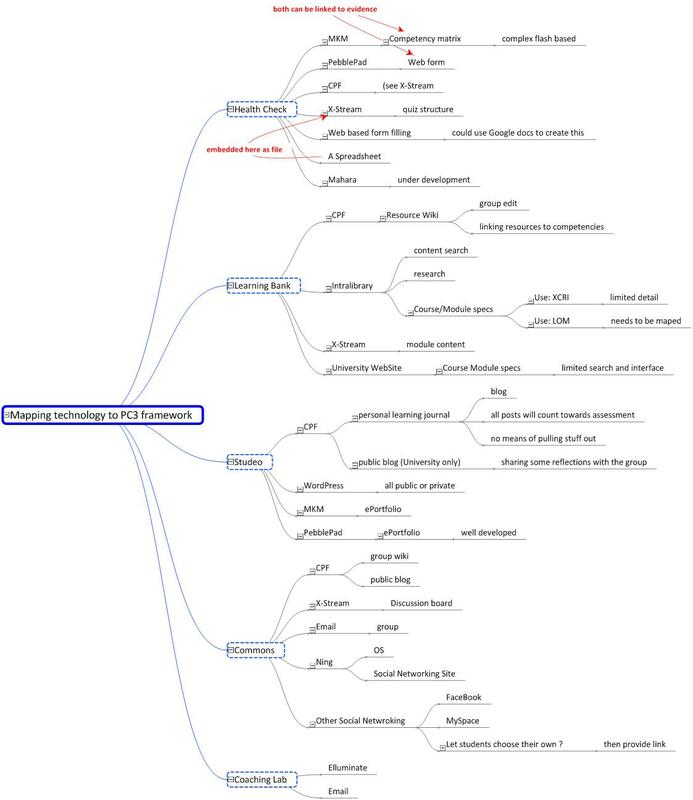 The MindMap below shows how various aspects of CPF and other apps could be used to build the PC3 framework. The permissions setting is a bit of a bind, and doesn’t really achieve what we were looking for. Being able to reflect and then choose who, if anybody, to share that reflection with is an empowerment feature that encourages ownership of the work. How important this will be I’m not sure at the moment.